The Chicago Bears are certainly going to evaluate a change at the quarterback next season, and one of the highest-profile players at that position could very well be on the team’s radar. According to a report by CBS Sports, the Bears are expected to make New England Patriots back-up quarterback Jimmy Garoppolo one of their top offseason targets, and with the third overall pick in this year’s NFL Draft and some solid young players, they could put together an attractive package if they decide to make him their next starting quarterback. 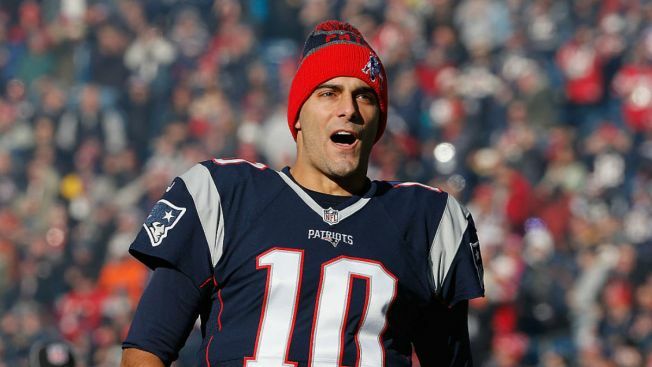 Garoppolo, who started for the Patriots while Tom Brady was suspended earlier this season, played college football at Eastern Illinois and was born in Arlington Heights. In limited NFL action, Garoppolo has appeared in 17 games, throwing for five touchdowns and zero interceptions on 63 career passing attempts. The Bears seem poised to make a change at the quarterback position after a down season for Jay Cutler. The quarterback, whom the Bears acquired in a trade with the Denver Broncos in 2009, still has four years remaining on the contract he signed before the 2014 season, but none of the money is guaranteed, so cutting him wouldn’t hamstring the Bears financially as it would have in the past. If the Bears don’t go after Garoppolo, there may still be options on the horizon. It’s unclear whether or not Kirk Cousins will re-sign with Washington, so there could be an opportunity there via trade or free agency, and the Bears could also select a quarterback in the NFL Draft, with Clemson’s Deshaun Watson, North Carolina’s Mitch Trubisky, and DeShone Kizer ranked as three of the top players at the position in this year’s class.